This new metric lets you know how frequently a process is acted on WHEN it is running. Some processes run all the time (resident) and thus may have a high restraint count, but a low Frequency of ProBalance Action. Note that this metric is presently not finalized and subject to further revision, but these are the first builds where it is viable. Why ‘Action’ instead of ‘Restraint’? As I say often, I loathe using the term ‘Restraint’ because ProBalance really doesn’t slow anything down. 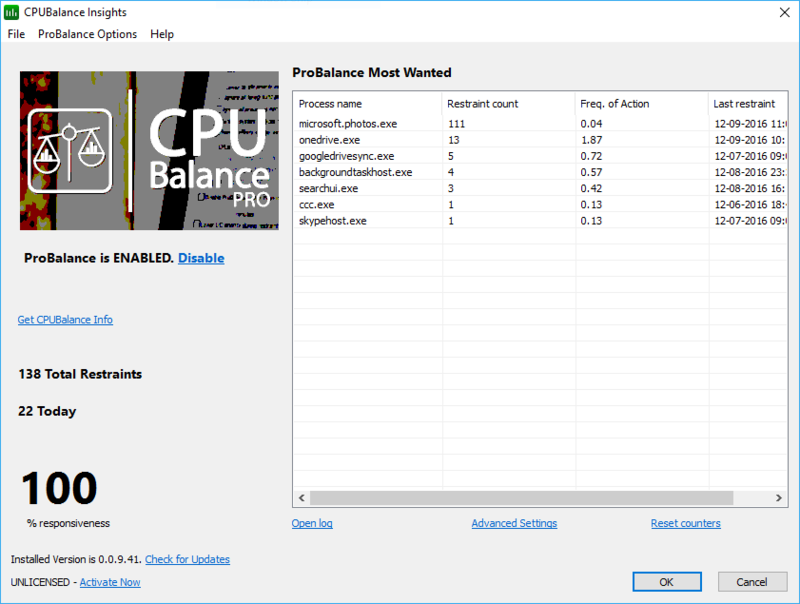 ProBalance’s marginal, temporary adjustments to process priority classes (by default) does not really impact the target process, but DOES deliver the few CPU cycles needed to restore system responsiveness during these high CPU loads. In fact, if there is no other contention for the CPU, ProBalance will literally have no impact on the performance of a process it acts on.